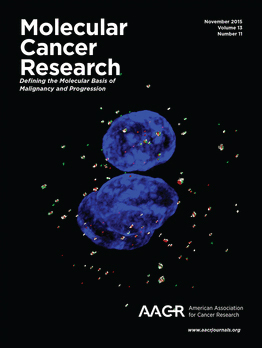 PhD student Tor Espen Thorvaldsen, together with postdoc Nina Marie Pedersen and their co-workers in Harald Stenmark's group at Institute for Cancer Research and Centre for Cancer Biomedicine, have published a cover story in the November 2015 issue of Molecular Cancer Research. In this paper, Thorvaldsen and co-workers have explored the fact that Tankyrase inhibitors, which are potential therapeutics in WNT-dependent cancers, induce cytoplasmic puncta (degradasomes) consisting of components of the signal-limiting WNT/β-catenin destruction complex. They find that the Tankyrase-induced degradasomes are dynamic assemblies that function as scaffolds for rapid turnover of the signaling component β-catenin, and they use super-resolution and electron microscopy to characterize the degradasomes as heterogenous protein structures in the cell. These findings have implications for further studies on Tankyrase inhibitors as prospective cancer drugs. The study was a collaoboration with the group of Stefan Krauss at Oslo University Hospital, which has pioneered the development of Tankyrase inhibitors. 3D super-resolution microscopy of SW480 colon carcinoma cells reveals an irregular shape of the induced degradasomes and a non-homogeneous distribution of tankyrase (green), β-catenin (white) and AXIN2 (red) in subdomains. 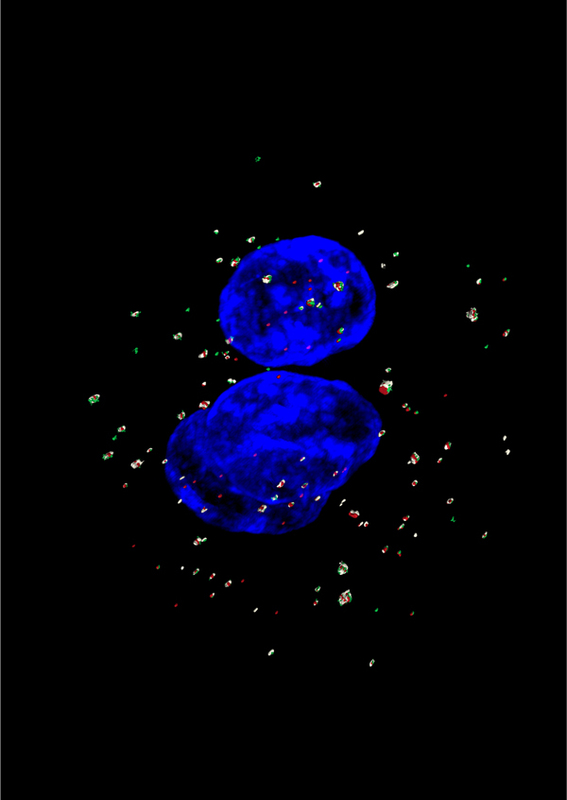 Nuclei are in blue. Thorvaldsen and colleagues (p. 1487), demonstrate that β-catenin is rapidly turned over in degradasomes upon tankyrase inhibition and provide a direct mechanistic link between degradasome formation and reduced WNT signaling in colon carcinoma cells. Structure, Dynamics, and Functionality of Tankyrase Inhibitor-Induced Degradasomes. Thorvaldsen TE, Pedersen NM, Wenzel EM, Schultz SW, Brech A, Liestøl K, Waaler J, Krauss S, Stenmark H.
Mol Cancer Res. 2015 Nov;13(11):1487-501. doi: 10.1158/1541-7786.MCR-15-0125. Epub 2015 Jun 29.